1. The weekend before the equinox Siduri and I did our Mabon rite. Since early in the year we’ve been working through the rituals in Sunna’s Journey. It’s a collection of rites for the eight holidays of the neopagan year, along with some others, all done in the ADF ritual style. We both like the ritual format, and the book itself, but that’s the extent of any work either of us will be doing with ADF. It IS nice to have a Heathen-style ritual format which also allows for spiritual and magical workings. We’re already plotting for Samhain and want to do a few different things then. During the rite we also did trance work involving Bear Mother. It’s something we’ve done in the past at different times but I felt strongly like I wanted to do some that night. We both used some of Sarah’s ointments to aid in our working. My choice was one of her datura offerings (Datura and Dwale, a limited item made earlier this year) because I have been wanting to work with datura and had not before. My travel was rather different from what I have experienced with her other salves. Instead of it opening me up easier and helping guide, I found myself doing the trance but the moment my focused wavered I wound up in a new, random setting. Nothing troublesome, thank Gods, but nothing I have experienced before. I’m hoping over the winter to work more with both datura salves I have, since they seem to produce a notable response for me. 2. Beth and I have been friends for over a decade and I’ve been supporting her shop since she started. Over the summer she put up a cord I gazed at longingly for a few days, but when I wanted to buy it, the cord had been sold. 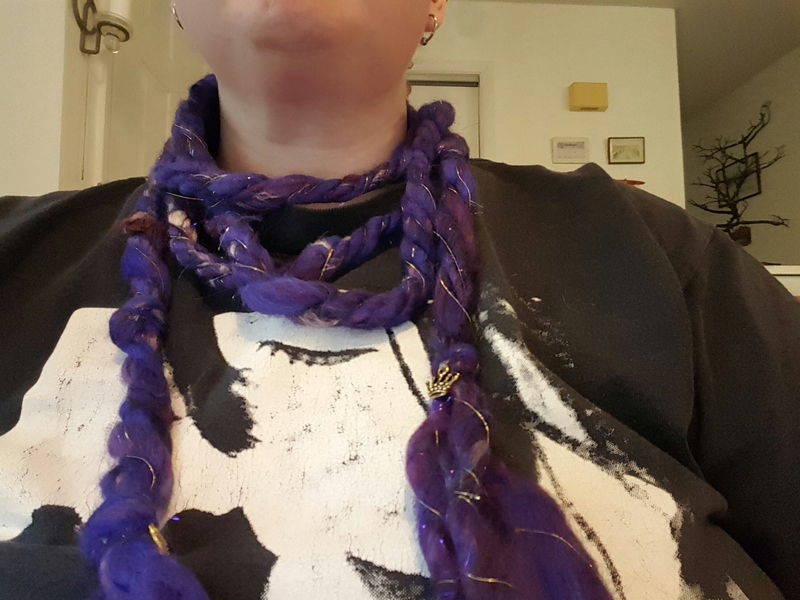 To my joy, she made another one recently, and I jumped on the new sovereignty cord as soon as possible. It’s such a tranquil and grounding item I can’t get over it. Plus, it’s purdy. 3. The new deities in my house both have shrines now. One has a statue, the other a print, but both have candles and incense (again, from Beth), a necklace each, and for one, a pouch I made at Harvest Gathering in August. Soon there will be photos because shrines continue to manifest in my house. 4. It’s a wonder what a good additional supplement or two will do for sleep. In my last consultation with my nutritionist I mentioned less than ideal sleep, and she suggested melatonin (which I’ve used before to mixed results) and an amino acid called serine. The first night alone was such a marked change! I give a lot of credit to both for my health improvements over the last month. Oh what good sleep can do for a person! 5. My favorite Thracian posted late in the summer that someone he knew would be offering a few weeks of one on one language instruction in about a dozen different languages. Me being the budding linguistics nerd jumped on the offer. At first I thought i would do Vietnamese (because the caveat was it had to be a completely new language to the person) because why not, then realized ancient Greek would be a better choice AND helpful to my job. (Yes sometimes I do need to be able to figure out the random phrases in Greek letters included in book requests.) Four weeks in and it’s been rather enjoyable. Now if I could just get enough hours and focus to work more on the material on my own! In case your own language interest has been peeked, check out ILT for information. 6. Yes I did change the blog theme. Next up, a full update of links! And maybe a few more posts.